Watching the Facebook and Cambridge Analytica story unfold is to see the importance of crisis communications planning. How much coverage has been dedicated to fb’s slow-to-respond posture? Or Mark Zuckerburg’s reluctance to face the music? But this is only the latest crisis to dominate the news scene. We’ve also seen a fatality resulting from an Uber driverless car. And, last month, it was KFC’s lack of C’s in England. But, while each of these provides extraordinary and international optics, the fact is in this world of cyber threats, ransomware, the #metoo movement and broadly shared fake news, all businesses should be prepared for their own crisis. And preparing doesn’t mean bracing yourself. What are key areas of exposure or potential scenarios that could develop into a crisis? Such anticipation can provide opportunity to diminish the impact or eliminate a potential crisis altogether. But it also allows for planning your specific next steps — if and when the scenario comes true. and control response to and management of a crisis event? Who will maintain contact with authorities or antagonists to keep your team informed and up to date? Who will be the key spokesperson or people communicating with staff, stakeholders and press? Who will draft holding statements to keep your company responsive as the greater scope and impact of the crisis is unfolding? Identify stakeholders and those who will be impacted by a potential crisis. Who within and beyond the company (ie: Vendors? Customers?) is impacted? What about the community at large? If there are personal victims, consider stakeholders from the victim’s perspective, not just those who have a stake in your business. Are there influencers who can put this crisis in context? Who determines its larger –or less so – significance? Note this isn’t to spin the importance of a crisis, so much as to accurately frame its impact. What operational protocols and procedures should be put in place to maintain day-to-day business as much as possible? How do you continue to operate in a manner that reassures your actions reflect your messaging to staff and stakeholders? And, crisis planning should also provide document templates, a social media guide, spokesperson training and notification systems. Certainly, victimless crises leave broader room for creative response. 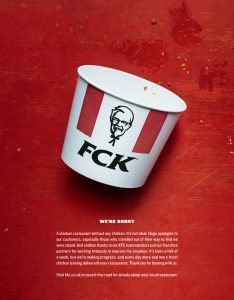 As KFC demonstrated, your response to a crisis can offer a tremendous opportunity to engage with your customers and reinforce their regard for your brand. Few manage that as deftly as they did. But, confidence in humor can only be managed when a company has successfully planned ahead.